Calling for a genuine referendum on self-determination, over 6,000 West Papuans took to the streets of Wamena, a town in the Papuan highlands, after a demonstration in Jakarta on 1 December 2016 had been violently suppressed by the Indonesian authorities. Taking Human Rights Day as an occasion, the protesters submitted a petition to their member of the House of Representatives, urging for a UN fact-finding mission to a region where the Indonesian government goes to any lengths to deter the local population from voicing its dissent. At least 6000 West Papuans are estimated to have demonstrated in the Papuan Highlands town of Wamena to mark Human Rights Day at the weekend [10-11 December 2016]. According to reports from Indonesia's Papua region, the demonstration was organised by the West Papua National Committee, KNPB. It was the latest in a series of large demonstrations by Papuans calling for a legitimate self-determination referendum. The demonstrators had initially converged outside the local parliament building, but due to the huge crowd decamped to a central street in the Highlands town. They were protesting about unaddressed human rights abuses, and reportedly signed a petition submitted to the Jayawijaya member of the House of Representatives. The petitioners urged the Indonesian government to accept fact-finding missions by the UN and the Pacific Islands Forum. Various ground reports put the number of demonstrators between six and eight thousand people. The KNPB has been central to some of the biggest demonstrations in Papua this year, several of which resulted in mass arrests. 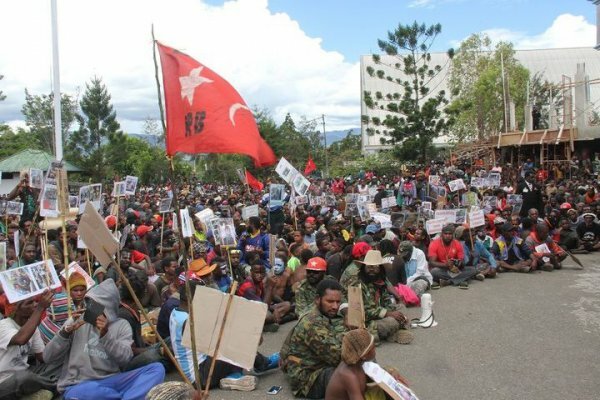 There were no reports of arrests at the Wamena demonstration, however police arrested nine Papuans at a demonstration to mark Human Rights Day in the capital of West Papua province, Manokwari. There have been reports from the Indonesian city of Makassar that police blocked university students in their dormitory, preventing them from demonstrating. This year has also seen an increase in demonstrations outside the Papua region by young people supporting West Papuan rights and self-determination aspirations.